Crestron is schedule to release a new connected home controller called the UFO-4X. Equip with touchscreen and control buttons the UFO wireless handheld controller is design to give you total control over your home automation systems, browse your media catalogue, the internet and manage media files within your integrated system. According to EH the UFO-4X will be available early 2011 at a retail price of about $2000. 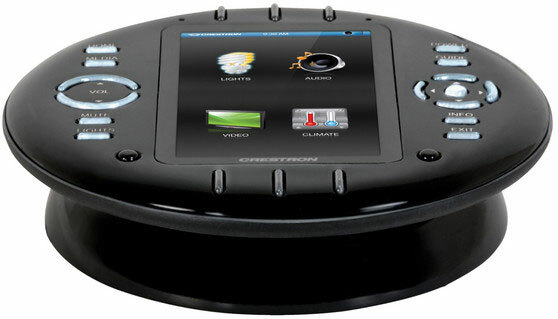 The UFO-4X integrates perfectly with the Crestron ADMS Media Server, a all-in-one media management system. Using the UFO-4X you can browse the internet and flip through your collection of media files on the ADMS, through its TV interface. With the ability scroll through available TV Channels, radio stations and control apps. Any appliance that is connected to your Crestron infrastructure such as your AC, heating, lights, security system, audio, video is accessible via the UFO-4X. The UFO-4X will come pack full of features for those who want to experience total control over all automated systems within the home. The UFO 4.3 inch active matrix touchscreen has a 16bit 800x400 WVGA colour graphics, and up to 200 feet RF range indoors it is perfect for home cinemas and supports roaming for extended range. It has integrated support for Adobe Flash object and Dynamic text and graphics.